Pasteurizers are a variation of our 30 year old rotary drum blanchers/cooker designs, but have different heating systems, different controls and a higher level of USDA/MID sanitation design features. Our pasteurizers were first used in 1988, and today we have systems running on very small pouches, and many more systems handling 5 to 10 lb pouches. Rotary Drum Systems are far superior to belt systems because they provide uniform process results, are easier to clean and have only one major rotating component (the cylinder) which doesn’t damage pouches or wear out and need replacement. 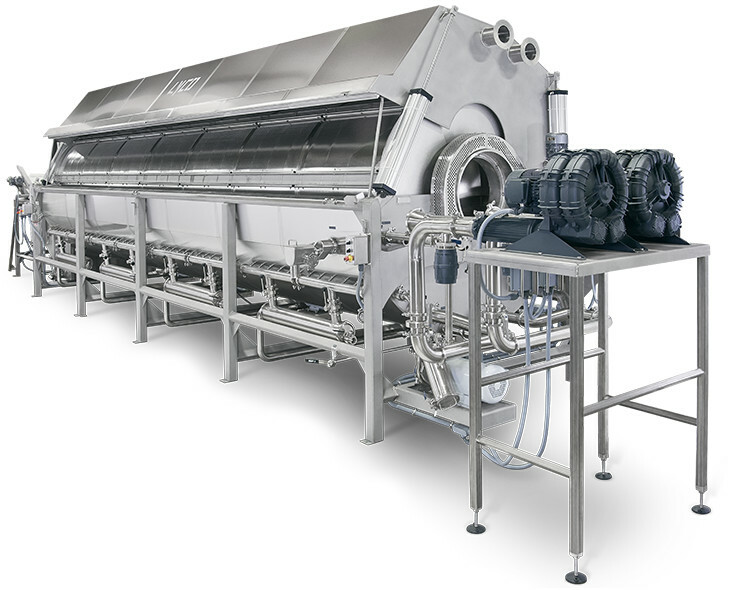 The Rotary Drum Pasteurizer from Lyco relies upon our innovative rotating cylinder design to gently agitate products for rapid processing without product damage. First used in 1988, today’s system can handle varying sized 5 and 10 pound pouches providing perfectly uniform process results. Our pasteurizer meets the high level of USDA/MID sanitation design features. The single, major rotating component doesn’t damage pouches or wear out, for longer product life. Chill-Flow™ Pouch/Tub Coolers are also a variation of our blancher/cooker/cooler designs first created 28 years ago for cooling vegetables. Today they are used for cooling many different pouch sizes of food such as fruit fillings, sauces, pizza sauce, chowder and soups.